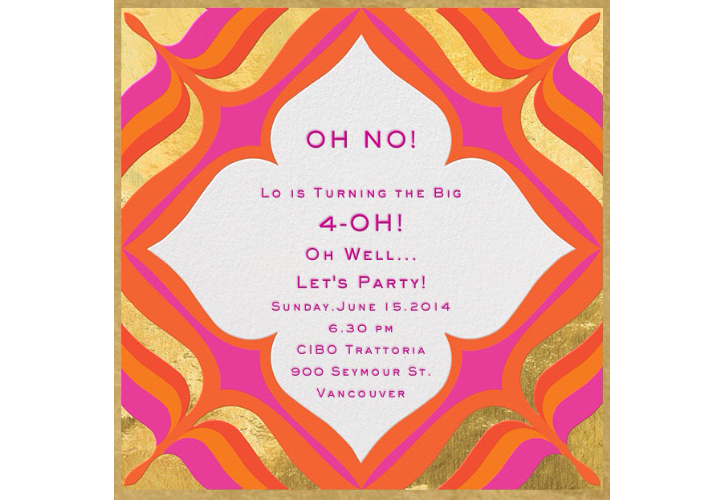 Lo Turns the Big 4-Oh! Well, Laurel would say she’s still got a few weeks to go in before she hits 40, but we surprised her this weekend with a surprise partay!! Scott , Jason and I have felt like we’ve been cheating on her! Trips into Vancouver to check out resties, texts, emails…. It was all worth it and I think she forgives us! Today I’ll fill you in on all the details that went along with the theme. I picked a palette of hot pink, orange and gold…Laurel loves bright bold colors and we both really love anything gold right now. I also knew she’s a big Jonathan Adler fan and the his e-vites on Paperless Post were perfect! I fought with myself whether I should go with paper invites or if e-vites were appropriate. I did a bit of research and it’s the way many people are going…and the e-vites from Paperless Post are so realistic with the embossed and metallic details. 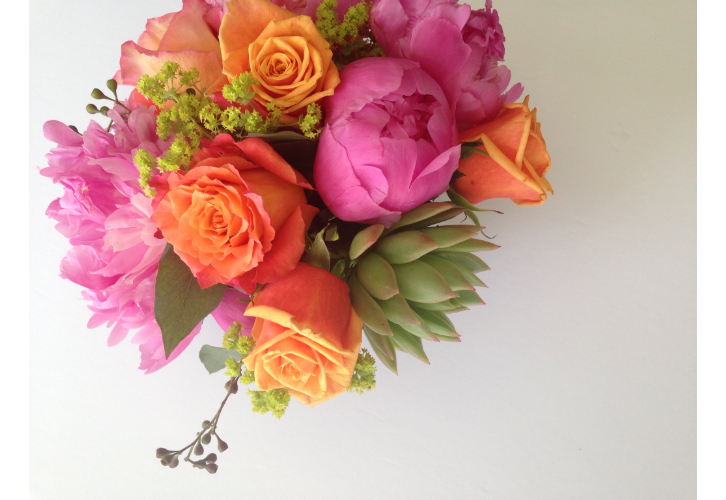 Forunately, peonies are in season and these hot pink ones looked and smelled ah-mazing!! We included orange roses and succulents, which I knew Laurel loves! Laurel and I are huge fans of macarons…we try them whenever we go, so I had some made as take homes. 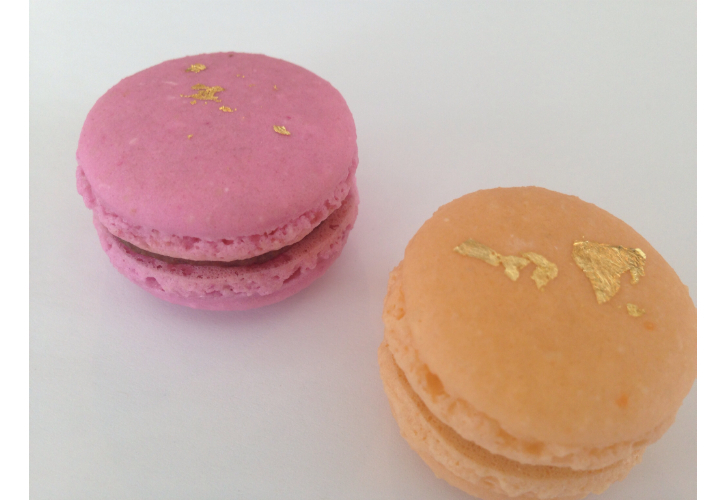 La Belle Macaron crafted these tiny beauties..gold foil and all!! The pink ones were raspberry with chocolate ganache and the orange ones were salted caramel. 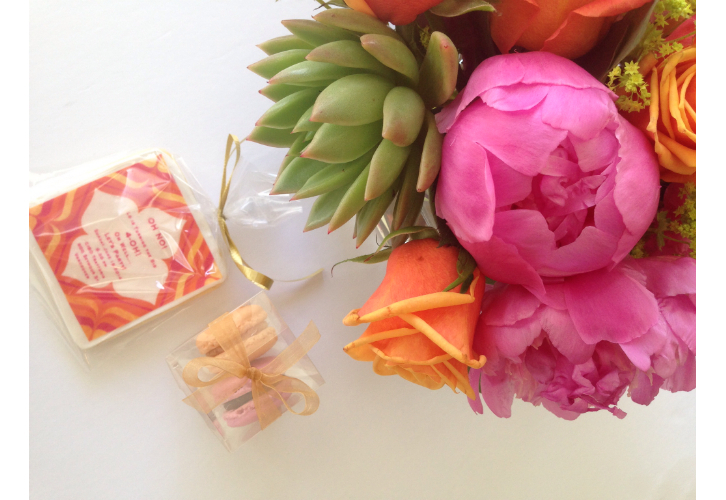 Decorated sugar cookies are also the perfect take home treat, so we HAD to some of those as well. 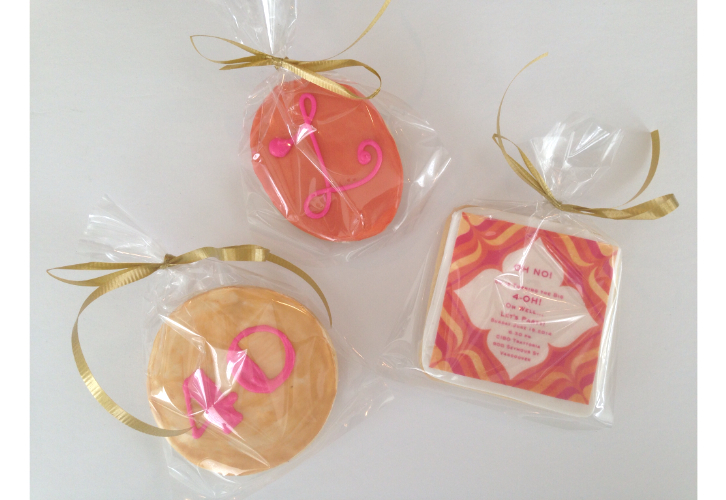 Pam’s Cookies did a great job creating works of edible art….she even made up cookies to match the invites! And how I LOVE the gold icing! I’m sure most of them were consumed on the drive home. The cake was chocolate with the top layer filled with coconut cream and the bottom layer filled with salted caramel, which was seriously delish. 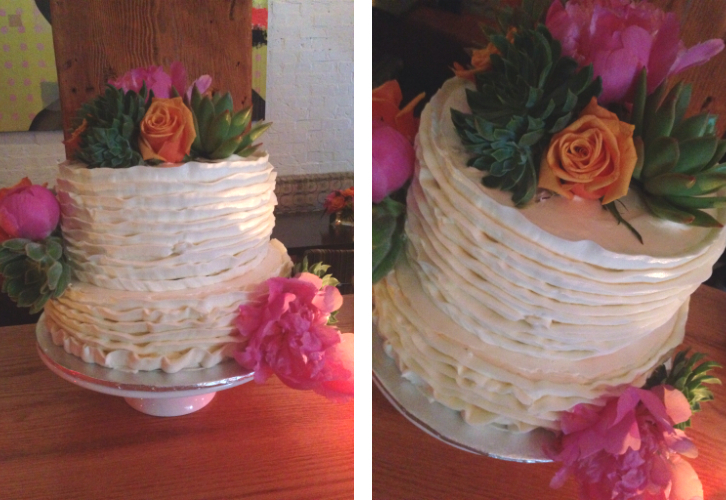 Verna’s Creative Cakes decorated with ruffled butter cream and our friend Andrea added extra blooms we ordered from the florist. 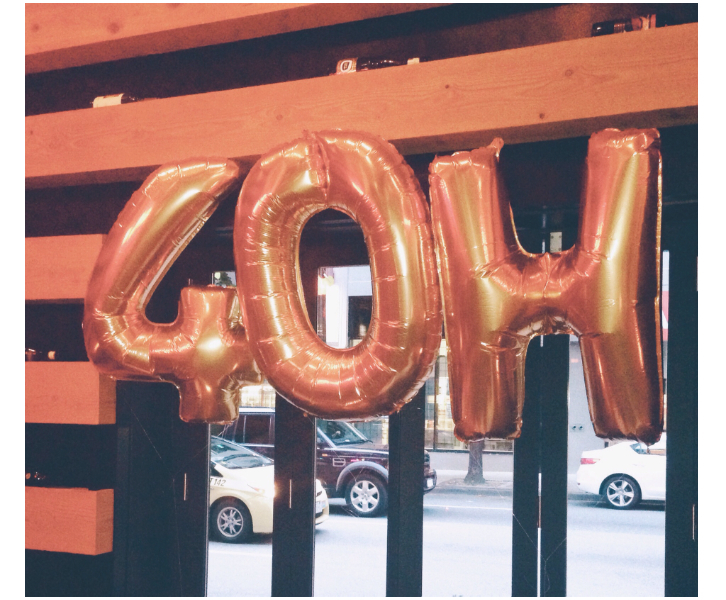 And I couldn’t throw a party without balloons…”4 OH”! I have to thank Scott for being an amazingly easy-going “client”….I’ll work for you again any day!! 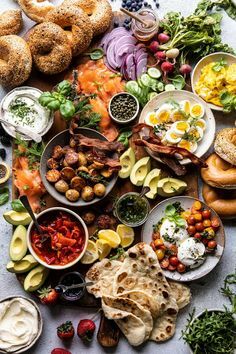 We have so many more details and pictures to share….oh, and we NEED to talk about the food at CIBO. So look for more on Lo’s Big 4-Oh on the blog very soon!